The Restaurant Mosaic team recently returned from their annual winter break and in true Mosaic style, we went all out on our opening night and Friday, 27 July 2018 will go down in history as one of the most special and fun-filled evenings at Mosaic. We have been close friends with Carl Schultz, and the rest of the team at Hartenberg Wine Estate, for many years. 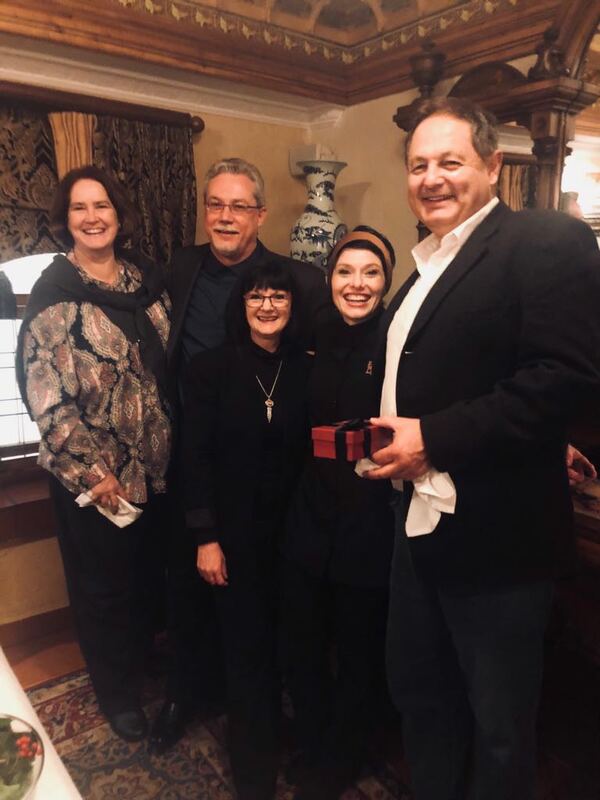 It was, therefore, an incredible honour for us to host Carl and his wife Carin, accompanied by Managing Director, Kobus Potgieter and his wife Susan, to celebrate Carl’s 25th anniversary as the award-winning winemaker of Hartenberg Wine Estate. 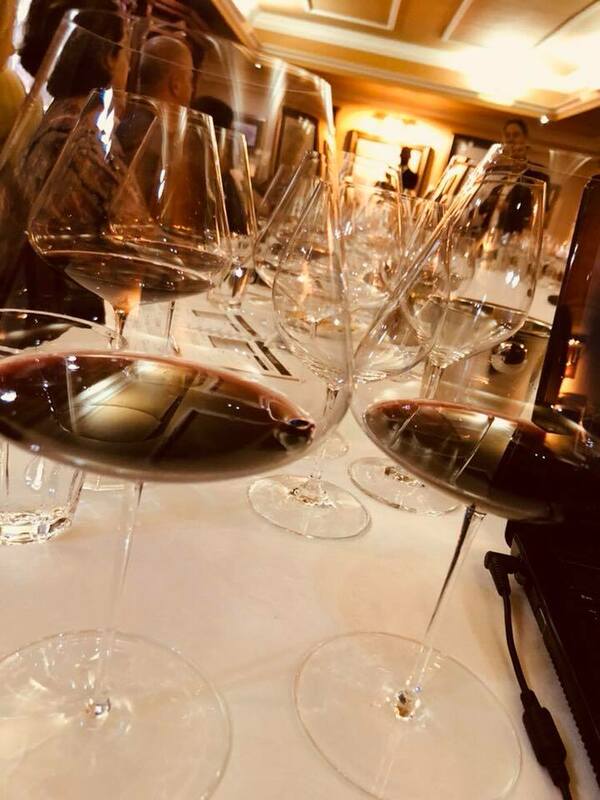 A select number of guests were invited to join us in this celebration of note, with a line-up of some of the very best wines made by Carl throughout his illustrious career at Hartenberg. After wetting our appetites with a selection of specially imported champagnes from the Mosaic cellar, guests convened to the tasting room where our cellar master wasted no time introducing the star of the evening. From the very first wine of the evening – The Eleanor Chardonnay 2009, named after matriarch Eleanor Finlayson, whose family owned Hartenberg Estate for 29 years until 1977. The Eleanor was made by Carl in her honour, reflecting her strong and resolute character tempered with sophistication and poise. “Not only is this wine inspired by Eleanor, but it is truly an expression of the soil in which the vines have grown and tender care that has gone into cultivating the grapes. Whilst it treats your palate to a splash of creamy citrus, nutty, mineral and elderflower flavours, it also shows a refreshing acidity. Overall it is very elegant with a persistent finish.” said Carl about this sumptuous wine. These words were music to the ears of a young aspiring winemaker and Carl has exceeded in this endeavour beyond any doubt. After Ken’s passing, Carl dedicated this extremely limited, specific Shiraz vineyard to his memory of Ken. “He absolutely loved Shiraz and I know he would have been very proud of this one!” said Carl of this big, bold Shiraz with its flavours of fig, black cherry, plum and sweet smoky spices. The Gravel Hill 2005 was the brainchild of Carl – the grapes coming from a small piece of vineyard at the foot of the hill on the estate. With low yielding vines and exceptional quality grapes, this single vineyard site was previously only produced as a single bottling in limited quantities after Carl joined the Cape Winemakers Guild in 1996. 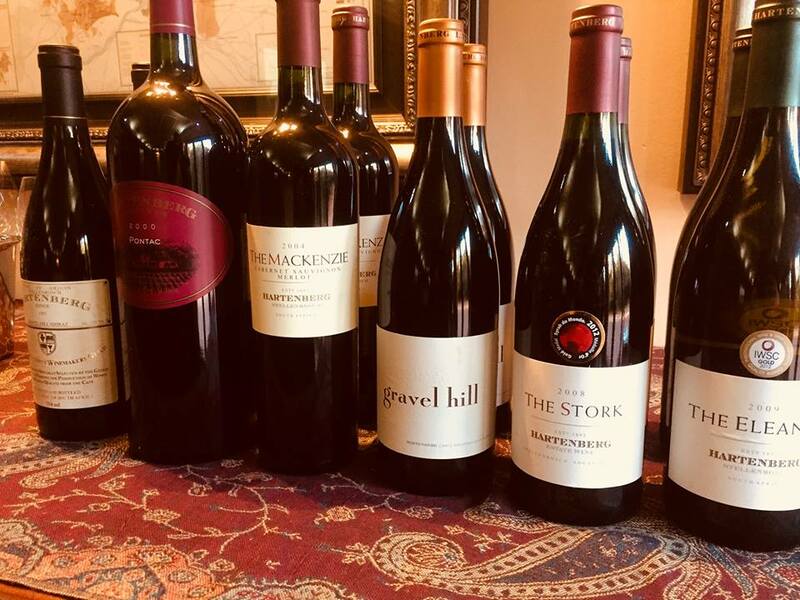 He produced 14 vintages exclusively for the CWG until 2004, when he decided to create the Estate’s flagship wine with this vineyard – aptly naming it Gravel Hill Shiraz. On a special note, guests were spoiled to hear that the 2005 was the very first vintage made by Carl under the Gravel Hill name. Elegant, black fruit notes with hints of violets, cloves, smokiness and black pepper, this was a blockbuster Shiraz and a firm favourite around the table. The next wine in the line-up was another wine made in recognition of previous owner Ken MacKenzie. This limited volume wine, aptly called The MacKenzie represents a vineyard parcel selection of the very best Cabernet Sauvignon and Merlot, producing a classic Bordeaux blend with notes of cigar box, leather, eucalyptus and hints of red and black fruits on the savoury finish. 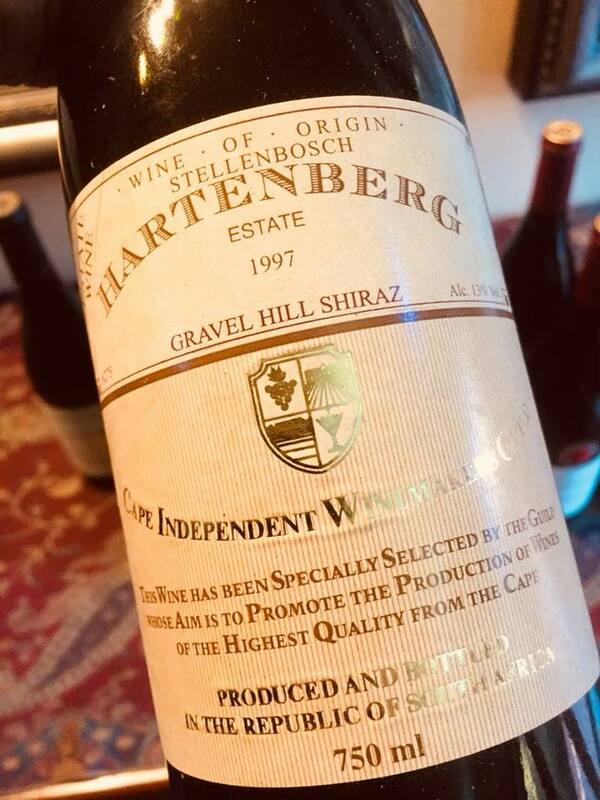 Despite being more than 14 years old, the wine was still unbelievably fresh and youthful with many years ahead of itself – the perfect ode to the man that rejuvenated the Hartenberg vineyards, wines and culture. 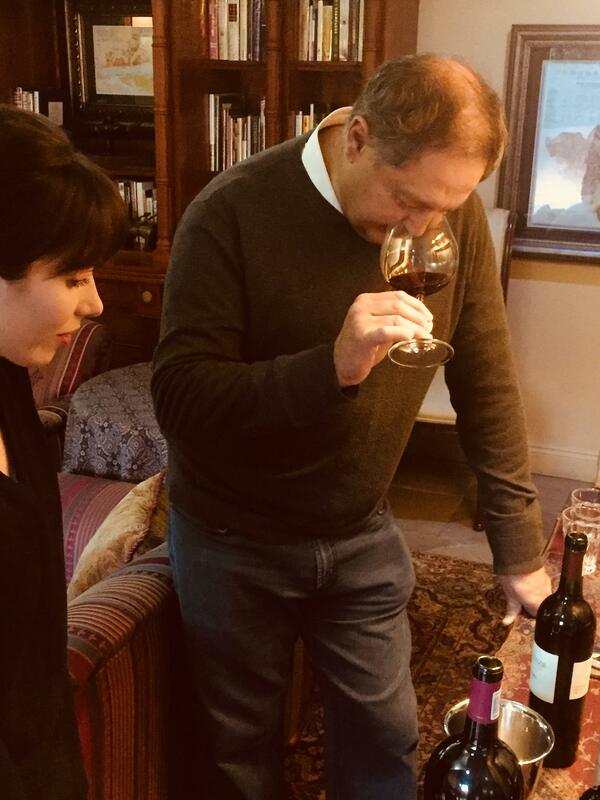 The final two wines of the tasting were both special in their own right and for completely different reasons… Our cellar master spoiled the winemaker and our guests by opening (for only the second time ever!) a rare magnum of the Pontac 2000. This distinctly red-fleshed variety found a home in South Africa, thanks to (probably) being imported to the Cape from Southwest France in the late 1600’s. According to historical records, Pontac was referred to as “Teinturier du Cher” (teinurier means ‘dye’), and was originally grown in the Midi to add colour to linen garments and later to wines. In South Africa, Pontac was blended and fortified, usually as a port-style wine until 1992, when Hartenberg first bottled it as a single variety wine. It is popularly thought that this was the first non-fortified bottling in South Africa, if not the entire world. 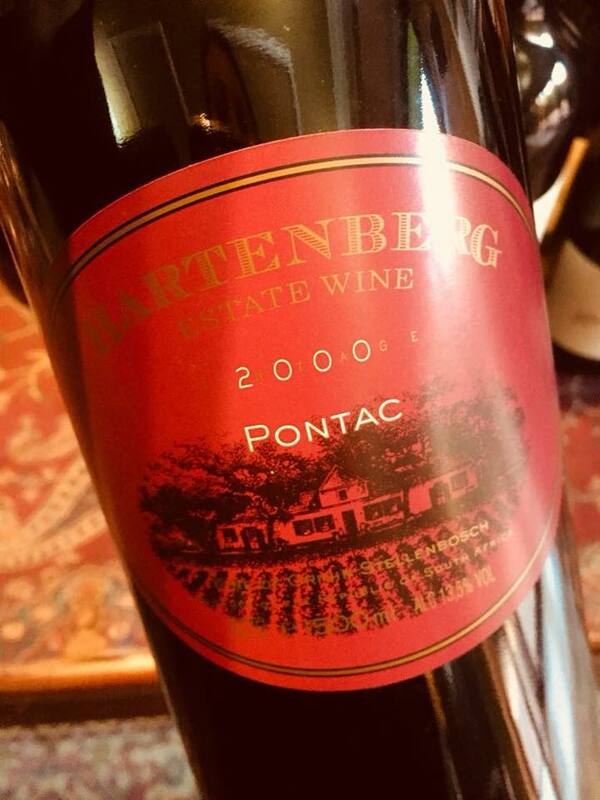 In 2002 however, Pontac (this 2000 vintage from Hartenberg) was bottled for the last time as a single variety as the vines were riddled with virus and struggling to ripen the crop. Bottled only in magnums in limited quantities, Restaurant Mosaic was lucky enough to receive a few bottles from Hartenberg’s private library and we are proud to say that we may be the only establishment in South Africa, if not the world, to have this wine in a single variety bottling! The Pontac 2000 is a simply breathtaking wine with forthcoming notes of mulberry jam, plums, prunes and hints of mushroom and damp dark earth leading to a fruity palate with a lovely balanced acidity and lingering finish. A legend! We will, of course, be stowing away the last remaining bottles in the deepest, darkest corner of the Mosaic cellar to open the next one in another 10 years! 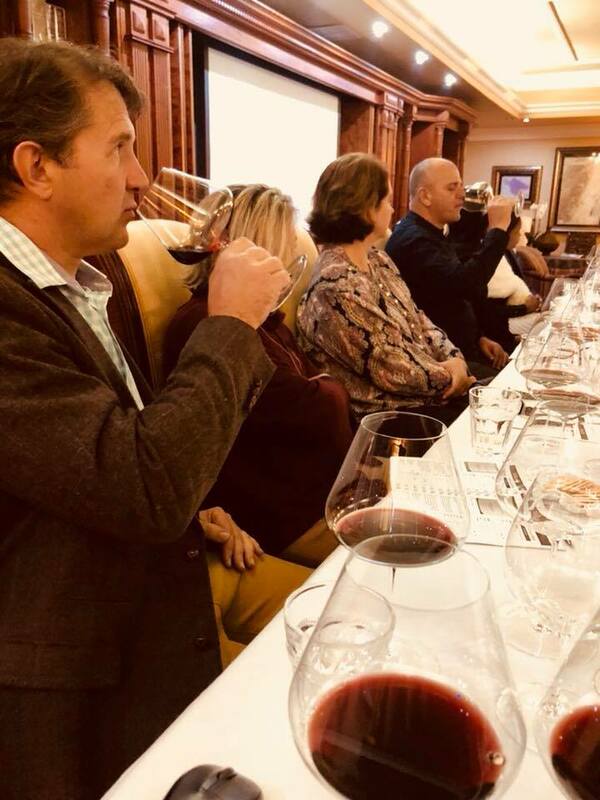 Lastly, Carl surprised guests with a gift from his personal cellar… The CWG Shiraz 1997 is not a commercially available wine as it was produced exclusively for the Cape Winemakers Guild. More than two decades old now, the nose had a touch of tomato leaf with notes of spice, mushroom and truffle, showing its age. There was however still a remarkable amount of red fruit aromas on the nose and palate – hinting toward the amazing ageing potential of this Shiraz, made from the iconic Gravel Hill vineyard. Thank you to Carl, Carin, Kobus and Susan for making the trip to Mosaic to share his incredible legacy and wines with our guests. We salute Carl and wish him the best for the next 25 years of award-winning wines!